The plethora of teen movies released each year usually entails some wacky comedies, urban social issue seriousness, battle from the bottom sports and of course medical maladies. 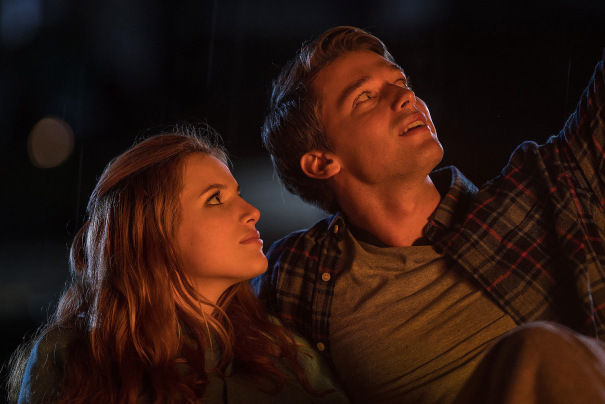 This year's "Love means never having to say you're sorry" film goes to Midnight Sun. Directed by Scott Speer and written by Eric Kirsten, it is based on the 2006 Japanese film of the same name. Featuring a rare genetic disorder called xeroderma pigmentosum which occurs six times more frequently in Japan, and one in a million in the U.S. Only 40% of people, depending on the severity, live beyond the age of 20. Bella Thorne plays Katie Price lives like a vampire in her small town Washington home with her dad Jack(Rob Riggle), a photographer. Her mom passed away when she was younger, so he acts as both parents, home school teacher and best friend. Until one day one of the neighbor kids, Morgan (Quinn Shephard) invites herself over, not letting the neighbor gossip get in the way. Katie spends her time watching life from her sunlight protected windows. Especially stalking Charlie (Patrick Schwarzenegger), who was the star swimmer at the local high school. Having injured himself in a stupid accident he lost his scholarship to Berkeley, so he's been moping around. That is until he cute meets Katie, who has taken to busk her music at the railroad station. Babbling in typical awkward teen talk, she runs off leaving her song notebook behind. Which means it's a good reason why they would meet again, thanks to machinations of Morgan. Katie who has never experienced life, enjoys the budding romance, with the handsome popular young man who has to reinvent himself since he had to stop swimming because of his accident. Katie can't bear to tell him of her illness not wanting to be pitied as the girl with the weird disease. Her father is apprehensive of the heartache that is sure to follow, and Morgan is doing everything she can to have her best friend enjoy some normal teenage fun. Katie tells him she is busy during the day, so she can only meet with her at night. He finally takes her on a special date to Seattle where she gets to hear live music, and he gets her to busk on the Seattle streets for an appreciative audience. Of course this perfect night was stymied, by the sunrise. This movie is filled with very pretty people and perfect romantic gestures. Charlie has got to be the most perfect boyfriend. Katie just glows as the newly in love GF. Filmmakers were not afraid to make her look more ill as time goes by. There are plenty of tear jerking poignant moments as they all deal with this bright light getting snuffed out. But it also addresses they need to believe the best in each other and try to help those who won't help themselves. At the screening everyone was given a box of tissues that were very much needed.